When a tooth undergoes decay, the decayed area needs to be removed to prevent it from spreading. After removing the decay a hole is left in the tooth (hence a “cavity”). That hole needs to be filled with a material to prevent decay from reoccurring. The filling also creates a good surface for normal dental functions like chewing. The material chosen is very important because there are many advantages and disadvantages to the different materials. At Arlington Family Dentistry, we use only tooth colored composite fillings and do not offer mercury silver fillings. For your benefit and dental education, we offer an explanation of the different materials, their advantages and disadvantages below. 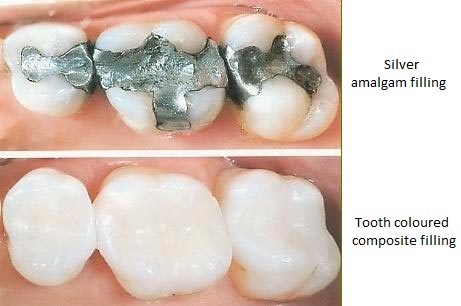 Amalgam is the traditional material used in a filling. Amalgam is made out of tin, mercury, copper, silver and zinc. They are often called “Silver Fillings” or “Mercury Fillings”. Amalgam fillings do not require special tools or advanced techniques. The process of an Amalgam filling is quicker and easier which makes them cheaper and a preferred choice for some dentists. Dental amalgam is very strong, second only to gold fillings. Though cost-effective, silver colored fillings are visible when a person opens their mouth wide enough to laugh or smile. This often looks unsightly and many people become more aware of their mouth and smile less. Additionally, the metal oxidizes over time and turns from a silver color to a black color. Fillings near the gum line tend to cause the gum tissue to turn black as well. The amalgam material does not actually bond to the teeth. The dentist has to do certain tricks to create a “pocket” to contain the material or has to use pins or other mechanical devices to hold the filling in place. This means that the amount of tooth removed for the filling is greater than it should be. It also means that the filling can pop out over time. Other concerns include sensitivity to the metal material. Metals are good conductors of heat and cold which causes sensitivity. Also, temperature changes in the mouth cause the metal fillings to expand and contract. Over time this can damage the tooth. Most concerning, the amalgam fillings contain mercury. Mercury exposure is extremely unhealthy. It should be noted no long term studies have yielded definitive results as to the potential dangers of mercury fillings. However, most health advocates would not recommend the use of mercury in the human body and are concerned about mercury vapor release over time. What are Tooth Colored Fillings (Composites)? Tooth colored fillings were introduced in the mid 1960’s. Overtime, the materials used have undergone continual improvements. This has resulted in materials that are harder, more durable, look nicer and are easier to work with. Today, composite fillings are made from a resin (containing specific plastic and glass particles). It is made to match your natural tooth color. Initially, the material is soft and easy to bend and shape. The resin can be used for fillings but can also be used to repair chipped teeth. This makes it a great choice for repairing chipped front teeth without the repair being visible. The resin material is then exposed to a special blue light which cures and hardens the material. This chemically bonds the material in place. The result is a natural appearance. It is also durable and strong since it is actually bonded to the tooth. So in the case of a chipped front tooth repair, a person can still bite into hard, crunchy foods without damage. This same process can be used to change the size, color, and even the shape of a tooth. For instance, if you needed to close a gap better or make your teeth appear more straight and even. What are the Advantages of Composite, Tooth Colored Fillings? There are no health risks associated with the use of composite fillings. The resin is made from inert, non-toxic ingredients. Composite fillings look natural. The color of the material is adjusted to blend naturally with your existing teeth. Composite fillings are strong. Whereas the material isn’t quite as strong as metal, the chemical bonding and hardened resin material restores 85% – 95% of the original tooth strength. If damaged, composite fillings can be repaired. Composite fillings are more comfortable. The materials used harden in seconds. Metal materials can sometimes takes days to harden. The non-metal material creates less sensitivity and discomfort for the patient. What are the Disadvantages to Composite Fillings? The use of composite materials requires more skill on the part of the dentist. This makes the experience and qualifications of your dentist even more important. Dr. La is highly experienced and adept at cosmetic dental procedures. Though the material is stain resistant, frequent or prolonged exposure to dark liquids can potentially stain the material over time. But it can also stain surrounding teeth as well and all can be repaired or whitened. Prolonged alcohol usage can potentially degrade the material used. Composite fillings are not as strong as metal fillings, but they are still very strong. There are alternatives to composite fillings. The most esthetic and long lasting alternative would be a laboratory created porcelain inlay or composite inlay. Inlays last longer than fillings and are more stain and alcohol resistant. Inlays are much more expensive because they require two or more visits and they are made in a dental laboratory. Inlays may be the best option in certain situations (the size of the area, the location, the required dental function). Inlays are a great choice if the budget allows for it and Arlington Family Dentistry can provide inlays. Dr. La can consult with you on your best options and which one is best for your situation. Many people are not happy with the amalgam fillings they received when they were children. Or perhaps the filling has increased in discomfort or sensitivity. Many patients are replacing their existing amalgam fillings with tooth colored composite fillings. Do you have a “metal mouth”? Do you smile less because you have existing silver / mercury amalgam fillings? We can replace your existing fillings with natural tooth colored composite fillings and give you a reason to smile again. Dr. La believes those teeth colored composite fillings are a stronger and healthier choice for our patients. The tooth colored material is metal free and made from plastic resin. They are very durable, tissue compatible, kind to the opposing teeth, and stain resistant. Tooth colored fillings allow us to preserve the greatest amount of natural tooth enamel, and perhaps more importantly, they are made from inert non-toxic ingredients. Call our office to make an appointment today. 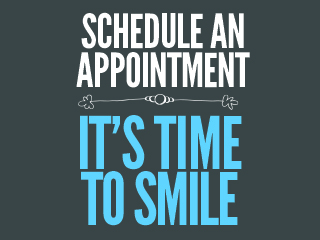 New patients and emergency dental visits are welcome!